Marlene Dietrich: I don't have kitschy feelings like that. None of us did. I was born a German. We didn't have kitsch. We didn't have sentimental feelings. I have feelings for people, but I have no feelings for cities or things like that, no. 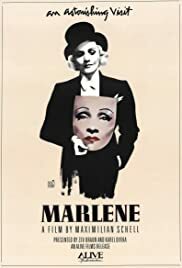 `Marlene' includes generous extracts from many of her movies from the silent era in Germany to her final role in `Just a Gigolo' with many gems in between. Deitrich claims never to have watched her own films but director Schell runs excerpts on a video machine and gets her comments. She also talks about her contribution to the Allied war effort, the desire of the German people for strong leadership and her contempt for Hitler. Schell & Deitrich, who appeared together in ` Judgement at Nuremberg' often disagree sharply, and listening to Marlene hold her end up in the exchanges it's easy to forget that she was 82 years old when this documentary was made in 1983. Summing up, `Marlene' is a must-see for anyone interested in older movies and her rendition of `See what the boys in the back-room will have' from `Destry Rides Again' alone is worth the money.